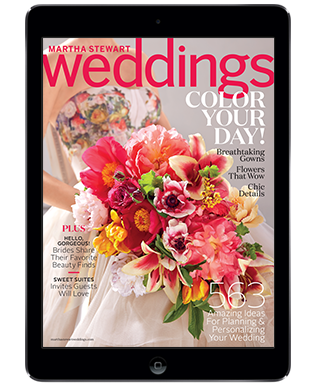 For help with your digital edition, call 1-800-846-4004 or visit our Martha Stewart Weddings customer feedback page by clicking here. Q. How do I get the Martha Stewart Weddings Digital Edition? Q: I am a digital subscriber. How do I access my digital edition? Download the app from the Apple App Store: Click here to download the FREE App. Tap the "Sign in" button. Enter your Email Address and tap "Continue." Create a password, then tap "Continue." Verify your account by entering your account number. To access your account number, refer to your confirmation email or call 1-800-846-4004. Then tap "Submit." If you have already registered on marthastewart.com, you will be taken to a page that says, "Thank you! You now have Digital Access" at the top of the page. Your issues will be available for download. Q: I want to use my account number to access my digital edition. How do I find it? A: You can access your account number in your confirmation email or by calling 1-800-846-4004. Q: I am a print subscriber. Can I get the digital issues as part of my subscription? A: A print subscription does not include free access to digital issues. Q: Can I buy a subscription to Martha Stewart Weddings magazine on my device? A: Yes. Monthly and annual subscriptions are available, as well as single issues. You can subscribe or download issues in the app store. Martha Stewart Weddings is published 12 times a year. Q: How do I cancel my digital subscription from my iPad? Select "Contact iTunes Store Support"
Select "Purchases, Billing & Redemption"
Q: How do I delete and reinstall the app on iPad? A: From the newsstand, tap and hold down the magazine app icon until it starts to shake. Tap the black "X" in the top- left corner, and tap "Delete" in the notification box. Return to the Apple App Store and reinstall the magazine app. If you have already purchased issues, you can re-install them for free: tap "Sign In" in the top right-hand corner and log in using the email address and password you set up from your previous account. Then re-download previously purchased issues. Q: How do I restore issues I purchased as a subscription through my iPad? A: Please open the app and tap on the "Gear" button in the upper right-hand corner. You will then need to tap on "Restore All Purchases" and enter the same iTunes information you used to purchase the issue or subscription. You may then return to the Library screen and all available issues should now have a "Download" button next to them. Q: If my issues are taking awhile to download, is there a way to speed this up? A: Make sure you have a strong WiFi connection. The issues will not download over a 3G connection. If there are other devices currently on your WiFi connection, consider disabling them temporarily until the issues are done downloading. You may also want to see if any other downloads are in process on your iPad. If there are, wait until they have completed before downloading the issue. Q: I cannot get an issue to download. What can I do? A: Make sure you are connected to a Wi-Fi network. Our digital editions are too large to be downloaded using a 3G connection. For any other questions about digital issues, contact our Customer Service Team at MWZdigital@cdsfulfillment.com or call 1-800-846-4004. Thank you!